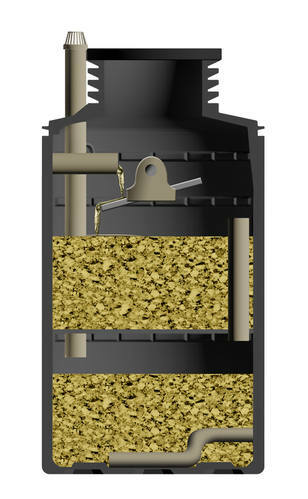 FilterPod non-electric, sustainable waste water sewage treatment systems are a UK design. person, sustainable, non-electric sewage treatment system. The tank is tested for all UK ground conditions, even ultra high groundwater sites. The tanks are installed in tandem for larger populations. FilterPod sewage treatment plants are powered by natural air currents or solar power and was tested at the EN Test Centre, through a Northern German winter - the harshest conditions for wastewater plant performance. Most waste water sewage systems are tested during the summer months in order to obtain the best results, but we wanted to test for the worst treatment performance instead. Why use electricity to power a wastewater system? In nature, sewage pollutants are broken down in a non-aquatic environment, without the use of electricity. This sewage treatment process is fuelled by oxygen in the air. The greatest amount of oxygen that can be dissolved in water is only 14.6mg/litre, whereas air has 299.05mg/litre oxygen - over 20 times more. This is why the most efficient breakdown of sewage pollutants takes place on and in the aerobic part of the soil, NOT in water. Why increase your family's Carbon Footprint when you don't need to? FilterPod, understanding the importance of this fact, designed a dry or terrestrial treatment system; one that is rich in oxygen and therefore highly efficient. All other sewage treatment plants are liquid-based. 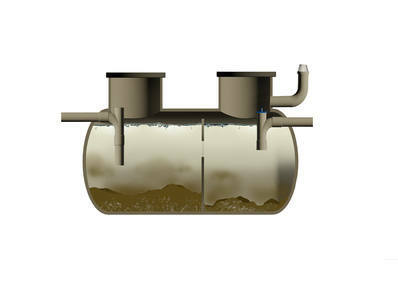 The FilterPod sewage plant separates the solids from the water in raw sewage and other household wastes. Conventional sewage plant systems leave the waste in the water to be broken down by electrically pumping vast quantities of air into the liquid effluent in the tank. The FilterPod waste water plant filters the pollutants from the water in the dry, oxygen-rich environment of the biofilter, fuelled only by natural air currents. The FilterPod sewage treatment plant process uses NO energy. Other waste water plants need a continuous supply of expensive electricity to drive the compressors, pumps, motors and discs that are needed to continually oxygenate liquid based systems. The FilterPod uses NONE for the sewage treatment process. The FilterPod treatment system also has no electrical parts to break down or replace. That is why the operating cost of a sustainable FilterPod sewage system is so low. The wastewater treatment process has an almost zero carbon footprint. FilterPod Sewage Treatment Plant Servicing by Sapphire Environmental Ltd.